Musical Companion to the 20th Century Fox Feature Film "Son of God"
Nashville, TN - (December 20, 2013) - Word Entertainment is partnering once again with Mark Burnett, Roma Downey and their production company LightWorkers Media to release SON OF GOD: Music Inspired by the Epic Motion Picture on December 26. 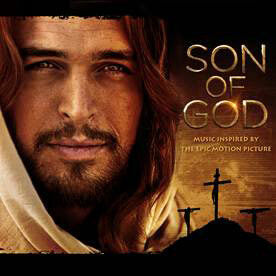 The 12-song collection, a musical companion to the 20th Century Fox feature film "Son of God" due out February 28, features music by today's top Christian artists including Meredith Andrews, Chris August, Big Daddy Weave, Jason Castro, Everfound, for KING & COUNTRY, Love & The Outcome, Dara Maclean, Point of Grace, Sidewalk Prophets and Group 1 Crew's No. 1 hit "He Said" (feat. Chris August). Artists included on the album have a combined total of 45 No. 1 hits and 25 Dove Awards. Also included on the compilation is "Oh, Son of God," a brand new song by Grammy-nominated artist and Dove Awards' 2011 "Artist of the Year" Francesca Batistelli. "We are incredibly honored that Roma and Mark have partnered with our Word family on the music inspired by CDs to 'The Bible' miniseries and now the motion picture 'Son of God,'" said Rod Riley, Word Entertainment's President & CEO. "Our artists' songs, from for KING & COUNTRY's 'Baby Boy' to the final song on the project, Meredith Andrews' 'The Gospel Changes Everything,' so beautifully complement the telling of Jesus' life, it made perfect sense to pair them with the motion picture." 1. Francesca Battistelli - "Oh, Son of God"
2. Chris August - "Jesus, Savior"
3.	for KING & COUNTRY - "Baby Boy"
5. Dara Maclean - "Our Only Hope"
6. Sidewalk Prophets - "Keep Making Me"
7. Point of Grace - "Only Jesus"
8. Jason Castro - "I Believe"
9. Everfound - "God of the Impossible"
10. Love & The Outcome - "He Is With Us"
11. Big Daddy Weave - "Jesus Move"
12. Meredith Andrews - "The Gospel Changes Everything"
Downey and Burnett brought the epic 10-hour mini-series "The Bible" to television audiences on the History channel with their company LightWorkers Media. It became the top entertainment telecast of the year, received three Emmy® Award nominations and has been viewed by over 100 million people to date. On February 28, they will bring the 20th Century Fox feature film "Son of God" to millions of people worldwide on the big screen. Word Entertainment partnered with Burnett and Downey to release the musical companion to the epic mini-series "The Bible." Announced earlier this month, they are also joining forces on "The Bible: Son of God Tour 2014" slated to commence on March 20 at Rick Warren's Saddleback Church in Southern California and run 16 dates through April 13. Celebrated Emmy-nominated actress Roma Downey and her husband producer Mark Burnett launched LightWorkers Media in 2011 with the children's DVD and book series "Little Angels" and its companion "Little Angels Storybook Bible". LightWorkers Media produced the ten-hour miniseries THE BIBLE and will be producing the feature film version SON OF GOD for 20th Century Fox. They recently acquired Alice Hoffman's award winning novel The Dovekeepers. LightWorkers Media is dedicated to shining a light and bringing uplifting content to people of all ages. A leader in the music industry for over 60 years, Word Entertainment, a Warner/Curb company, is a unique, comprehensive entertainment company comprised of multi-faceted artist service departments including publishing, merchandising, booking, and online initiatives. Word Entertainment represents some of the top names and brands in music, including Meredith Andrews, Chris August, Francesca Battistelli, Big Daddy Weave, Jason Castro, Patrick Ryan Clark, Everfound, for KING & COUNTRY, Group 1 Crew, Love & The Outcome, Dara Maclean, NEEDTOBREATHE, Point Of Grace, Sidewalk Prophets, Skillet, Switchfoot and We As Human and is home to 25 Entertainment, Word Distribution (representing Curb Records and Big Idea/VeggieTales among others), Word Music Publications & Church Resources, Word Films, Word Music Publishing and Word Label Group's Word Records, Word Worship and Fervent Records.